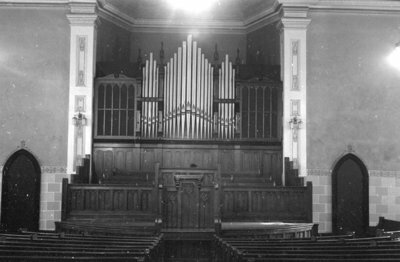 Black and white negative showing the organ loft at Whitby United Church. The woodwork in the church was remodelled in 1939. The Methodist Tabernacle was built in 1875-76 at the south-east corner of Centre and Colborne Streets. It became the Whitby United Church in 1925 and St. Mark's United Church in 1962. On April 1, 1929, a storm blew down the church steeple. The steeple fell onto Colborne Street. Whitby United Choir Loft, 1939, Marjorie Ruddy. Whitby Archives 09-004-057.